The blood of a Guardian, the heart of an artist, no one can hide the truth from Amanda Hayworth. Focusing her visions through her camera lens, she reveals secrets no one plans to expose, even her own. To protect herself, Mandy hides her ability in plain sight, photographing local bands and showcasing the dramatic images on her website. Most bands beg for a feature article. But the new lead singer of one particular up and coming band isn’t like anyone she’s ever met. Lucien entangles her with his mystery and makes Mandy want things she’s never wanted before -strings. Lucien Slovak has to impress an influential music blogger whose promotion could skyrocket his new band to stardom or flush them straight into the gutters. But the moment Mandy aims her camera in his direction, he fears the images will expose his ties to the immortal he’s sworn to protect and destroy his one chance to live out his musical dream. Hiding from her camera is tough enough. Denying his growing feelings becomes an impossible feat, forcing Lucien to choose between his oaths as a Guardian, his rock-star dreams, and the girl he wants. Secrets define them. Lucien’s bind him to silence; Mandy’s bring her nothing but pain and disappointment. Only when they focus on what’s behind the images can they embrace their secrets for what they are – truth. Look for it where ebooks are sold on September 15. Without further ado, HERE IT IS!!! Did I mention that Images Eternal by Toni Decker will be available for purchase on September 15? That’s September 15, mark your calendars. 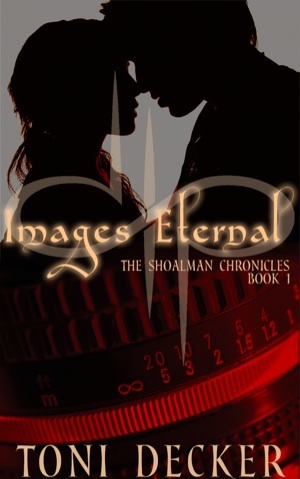 AND you can look for Shoalman Immortal, book two in The Shoalman Chronicles in January 2015. Special behind-the-image exclusive: The cover was designed by an incredibly talented graphic artist, Sharon Carpenter. I can’t tell you how wonderful it was to work with her and we can’t wait to see what she comes up with for the next cover in the series. Want to see how she works her magic?? Check it out here. Two authors telling one sizzling story after another about twenty-somethings getting along together in their own crazy, fantastical worlds. Both women are wives and mothers, sharing brain cells and characters as if they only exist with the other. Toni, one half of the Toni Decker brain, is an avid reader of all things Young and New Adult, while Kira, the Decker half of the Toni Decker brain, devours fantasy for midnight snacks. You can chat with both Toni and Kira on a variety of social media. We love talking books, writing, and life in general! Twitter: @ToniPicker and @KiraDecker, and stay tuned to @ToniDeckerBooks for more updates and teasers for the upcoming release. I thought it was going to be your book. Pouts. Lol! No, I’m pretty certain I don’t have the courage to write my own reveal like this! I’m hoping to have something more definite about mine within the next few weeks. *fingers crossed* but thank you do much for saying that, Linda! What a great write up. Not really my genre, but makes me want to read it.